So… How’s your bracket doing? Well, I’m in the “there’s always next year” mindset right now, but there is still some great basketball left to watch this year – I just guessed that the wrong teams would still be playing when I filled out my bracket a week ago. One of the teams that I did predict to go this far, though is still in it. The Louisville Cardinals are the defending champions and I would be okay if they repeated. 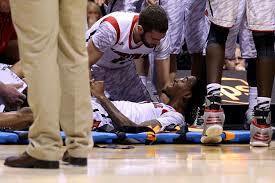 Luke Hancock comforts and prays for Kevin Ware moments after his gruesome injury in last years NCAA basketball tournament. They won me over last year when I saw and read about what happened in the wake of one of the most gruesome things ever witnessed on live network TV. 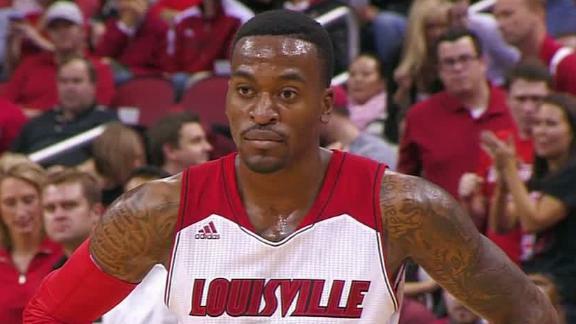 Guard Kevin Ware went up to contest a 3 point shot and when he landed, his leg broke mid shin and set off a violent reaction among teammates and fans. But amazingly, Ware’s teammate Luke Hancock came right over to comfort and pray for Ware. You can read my blog post about last year’s Cardinals championship team here. Amazingly, Kevin Ware is back on the team and while his minutes have been limited (he appeared in only 9 games this season) the fact that he is back and playing at all is a miracle. In fact, just six months after the break, video surfaced of Ware dunking a basketball. Check it out. 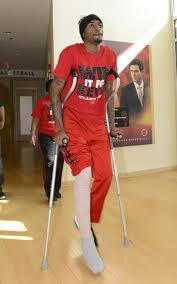 Ware on crutches days after the injury. His trust in God’s plan has prepared him for whatever may come, including a return to basketball. Here are my takeaways from Ware’s story and his return to the Cardinals. 1- Nothing happens that is out of God’s control – Ware talks about knowing that God had a plan to use this injury for His plan and purposes. We do face hard things in this life. In this world we will have trouble, but Jesus has overcome the world. (John.16.33). He tells His disciples this after telling them that they will be persecuted, thrown out of synagogues, murdered, and will have to go through these things without Jesus physically by their side, but with God’s spirit inside them. The hard things of this life are no joke, they are not a vague list of inconveniences. Like Ware’s leg, we will be broken by the hard things that we will go through, but our hope is in Jesus who died to pay our debt and make a way for us to be with Him in a place where pain and tears will not exist. To know that He is with us in the midst of whatever we are going through can help us bear it. 2- God is still God – I appreciate Ware’s attitude at the prospects of never playing basketball again. He says in the interview that if he can never play again, then he knows God will open up something else for Him to do. While we do have our own desires (which God knows) the truth is that God’s plan is the best. It may not always involve what we desire the most, but it will ALWAYS be the best. We simply need to trust it and follow. The Sweet 16 is this week, and Louisville is still in the process of defending their title. They have been through a great deal over the past year and God will use them, win or lose, to share his message with whomever may hear.